Some folks realized that it costs more to buy a brand name, but are not comfortable with just any third party generic product. 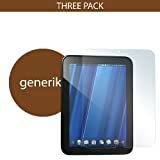 Generiks offers High Quality Clear Screen Protectors for your HP TouchPad. These are not your run of the mill cheap generic knock-offs. Generiks provide the same Optical Grade Clarity and protection for your HP TouchPad screen as the branded guys without charging you extra for a brand name and packaging. With 3 screen protectors included, you can share the wealth, or save em for later.